At 9:00 in the morning on Oct. 3, 1952, a 25-kiloton nuclear explosion vaporized the retired British frigate HMS Plym off Australia’s remote western coast. The Operation Hurricane detonation in the Monte Bello Islands was a seminal moment for Britain and marked its return to the club of great powers. But for Australia, these tests and others served a murkier purpose — as important and deliberate steps toward Australia’s own acquisition of nuclear weapons. It was in the tense Cold War environment of the late 1950s and early 1960s that these aspirations moved beyond talk and into concrete action. By the time the Hurricane detonation took place, Australia was already experienced in weapons of mass destruction. From 1943 and in the shadow of a possible Japanese invasion, Australia built extensive stocks of chemical weapons and delivery systems. That’s not all. Post-war British leaders realized that nuclear weapons were a must if Britain was to remain a first tier international player. However, the country’s small land mass blocked Whitehall from testing nuclear weapons at home. This is how Australia — with its vast coastlines and deserts — emerged as a key player in Britain’s nuclear strategy. When Britain approached Australia to host nuclear tests, a sympathetic government led by Prime Minister Robert Menzies readily agreed. While Menzies — an Anglophile — focused on his relationship with the United Kingdom, others saw this as an opportunity for Australia to buy membership into the nuclear club. But they would be disappointed. Throughout Britain’s early testing program and even after the subsequent construction of the Maralinga testing site, Australia did not gain access to the nuclear crown jewels. Between 1956 and 1963, Britain detonated seven weapons in the South Australian desert and in all cases kept Australian scientists at a respectful distance. The same cannot be said for nuclear delivery systems. In 1949, Britain and Australia established a joint weapons testing facility at Woomera where Britain tested technology such as the abortive Blue Streak missile. Australia was actively involved in the development of these technologies. Its taste for missiles and other weapons grew. One big reason — throughout the 1950s, Australian leaders felt insecure. To the north, the relatively young Republic of Indonesia was entering a period of great instability. Established in 1949 following independence from the Netherlands, Indonesia first appeared to be on the path toward democratic government. By the mid-1950s the future had become much less clear. Relations between Indonesia and the Soviet Union grew, culminating in a state visit by Soviet Premier Nikita Kruschchev in 1960. It was becoming apparent that the Communist Party of Indonesia, a.k.a. PKI, was exercising ever greater control over the government. While this ideological divide was troubling enough, it was the rapid growth of Indonesia’s military that became a serious concern for Australian defense planners. Enjoying what seemed to be a blank check from its Soviet patrons, Indonesia gained access to top of the line Soviet military technology. Of most concern was the Indonesian air force acquisition of the mighty Tu-16 Badger bomber. Arriving in Indonesia in 1961, the Badger represented the cutting edge of contemporary bomber technology — only the United States, United Kingdom and Soviet Union possessed similarly capable aircraft. Able to reach speeds of more than 1,000 kilometers per hour, altitudes of more than 40,000 feet and with a range in excess of 7,000 kilometers, the Badger-B was a formidable opponent. Armed with the first generation AS-1 cruise missile, Badgers could hold enormous areas — including northern Australia — at risk. With enhanced military capability and a newfound sense of confidence from its Soviet ally, Indonesia muscled in on Dutch New Guinea. While military efforts met with mixed results, Indonesian pressure eventually paid off with the Netherlands commencing a withdrawal in 1962. The memories of World War II still haunted Australia. The fall of Singapore had left the country alone and exposed in 1942. Now it faced a renewed threat from its northern approaches. With a deteriorating security outlook and the nuclear genie loose on the Australian mainland, defense officials had seen enough. On Nov. 2, 1956, Australia’s Defense Committee formally recommended the acquisition of kiloton-range tactical nuclear weapons. They quickly ascertained that direct acquisition of weapons from the United Kingdom or at least access to British weapons was the most realistic option. The United States was out of the question. Far-sighted U.S. policy makers had already implemented restrictions on the export of nuclear weapons knowledge. It was here that that nuclear politics and policy intersected. Prime Minister Menzies was happy to support his defense chiefs, but had no real passion for obtaining nuclear weapons. During the next two years, Australia raised the idea with Britain at defense, diplomatic and political levels. While British leaders were initially reluctant, they began to warm to the idea. They believed Australia could be a lucrative customer in the arms business — particularly for airborne delivery systems. British Prime Minister Harold Macmillan visited Australia in February 1958, and Air Marshall Frederick Scherger — Australia’s chief of the air staff — met with his U.S. and U.K. counterparts. But just when access to the weapons seems to have been within reach, activity trailed off. For the moment it seemed Australia had lost the political will to pursue the weapons. In 1962, the regional security situation deteriorated. When Britain and its former colonies began to press toward the creation of an independent and unified Malaysia, Indonesia launched a diplomatic and military offensive. The campaign came to be known as “Confrontation.” The conflict intensified when the Federation of Malaysia came into being on Sept. 16, 1963. Australia was rapidly drawn into the conflict. One of its key roles would be to provide fighter coverage for “Plan Addington” — the British Royal Air Force’s plan to conduct heavy aerial bombing of Indonesian targets in response to an outbreak of open conflict. Astonishingly, Plan Addington may have contemplated the use of tactical nuclear weapons stored at RAF Tengah in Singapore. When Britain’s secret plans to store the weapons in Singapore were made known to Australia, the opportunity to advance Canberra’s own nuclear cause was not lost on advocates. And then a series of very worrying reports began to emerge — including Indonesian Tu-16 Badgers spotted flying over Northern Australia. The reaction within Australian defense and government circles to these sightings can only be imagined. Nuclear capable jet bombers were possibly flying over the mainland undetected and beyond the reach of Australia’s Sabre jet fighters. To this day, neither country has acknowledged the identity of these aircraft or whether the overflights took place. There is, however, no doubt that the RAAF sharply increased its activity in September 1964. On Sept. 7, the RAAF rushed 16 sidewinder-armed Sabres along with supporting units to Darwin. The aircraft remained on various states of armed alert until Oct. 20. While the immediate threat of war caused by the Confrontation moderated throughout the later part of 1964 and early 1965, Australia continued to bolster Darwin’s defenses by stationing a detachment of Bloodhound anti-air missiles. From late 1965, an already confused situation took an unexpected twist. Sukarno was overthrown and the PKI purged from Indonesian society. The new administration of General Suharto immediately turned inward and focused on consolidating the regime. Suharto took steps to deescalate the Confrontation and tensions quickly eased throughout 1966. The “years of living dangerously” for Indonesia were over. While the immediate threat from Indonesia had passed, Australia’s renewed sense of vulnerability lingered. Heightening concern was Britain’s planned withdrawal from Asia which it completed in 1968. Adding to this, China detonated its first nuclear weapon on Oct. 16, 1964. In December of 1965, the Australian Defense Committee recommended the government revisit whether to acquire nuclear weapons. While studies progressed through 1965–1968, the political environment changed markedly. Harold Holt replaced Menzies as prime minister, and suddenly died. John Gorton followed Holt. Gorton was a former World War II pilot and a strong advocate for Australian nuclear capability. In the background, discussions about international agreement in the form of a Non-Proliferation Treaty gained strength. The window for Australia to develop an indigenous nuclear capability was closing. In 1969, the government announced plans to construct a 500-megawatt nuclear reactor at Jervis Bay in New South Wales. The intention was clear — this reactor was to support a nuclear weapons program. The reactor project pushed ahead and preliminary site work commenced. But politics and circumstances would intervene once again. Pressure grew on Australia to sign the Non-Proliferation Treaty, which it eventually did in March 1970 after much bureaucratic hand wringing. Australia held off on ratifying the treaty. But in 1972, the conservative Gorton government was swept from power and replaced. Gough Whitlam, a longtime advocate of arms control, wasted no time ratifying the NPT and abandoning the Jervis Bay reactor. In a heartbeat, the 40-year quest for Australian nuclear capability was over. There is, however, one startling and little known postscript to Australia’s nuclear weapons journey. Unlike the U.S. ballistic missile submarine fleet, the British nuclear deterrent has a curious twist in its command and control structure. Welded to the floor of the control room of each British missile submarine is a safe containing a document known as the “Letter of Last Resort.” The role of the letter is to provide orders to the commander of the submarine in the event the United Kingdom had been destroyed by a pre-emptive nuclear strike. Little is known about the contents of the letters and no British prime minister has ever disclosed the specific orders. Place yourself under Canadian or Australian command. The possibilities left open by these options are as intriguing as the letters themselves. As the Cold War continued, its major combatants became capable of destroying each other many times over. 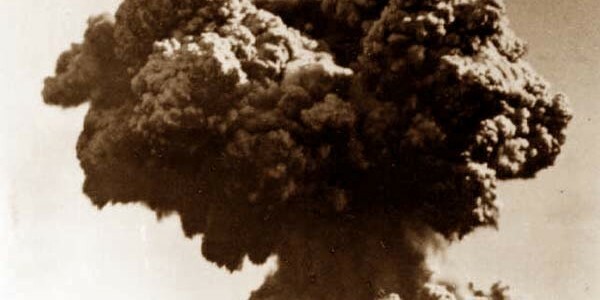 Most major powers including the United Kingdom, the United States, the Soviet Union and possibly China would have been smashed after a nuclear exchange. Similarly, Canada’s close proximity to the United States and the essential role played by it in air defenses would have made it an attractive target. Australia’s circumstances were somewhat different. Intelligence estimates did forecast that the USSR would attack Australia with nuclear weapons in a global exchange. However, the missiles would most likely target local U.S. facilities which were in isolated areas of the continent. Considered together, this scenario leaves us with something befitting of a Greek tragedy. A battered but still coherent Australia, alone and without allies, could have found itself holding the British nuclear card it had sought for so long — only to find there was no one left at the card table.